Our Colts cricket coaching programme puts the differing needs of players and their families at the forefront of our Colts cricket offering. The programme has been developed to ensure that we can meet the needs of many different groups, ranging from the youngest players - who are keen to have fun learning the cricketing basics with friends - to our older Colts, who are ready to move on to senior Saturday cricket. Keep up to date via our designated Colts Facebook page @ https://www.facebook.com/anstyCCcolts, our club website http://www.anstycc.org.uk/ , or our Twitter feed @AnstyCC Summer Colts training takes place on Friday nights between 6.30pm and 8pm at Ansty Cricket Club, RH17 5AS, when there’s cricketing coaching for the children aged 5-12 years-old; plus the opportunity for parents to sit back and relax on a Friday night too! Summer training sessions for our u13s, u14s and u15s run alongside senior net sessions on Thursday evenings. Winter training runs throughout the off-season (October to March) and takes place at Warden Park Secondary Academy. Ansty Cricket Club has full Clubmark accreditation and training session are supervised by ECB qualified Level 1 and Level 2 coaches. You can access full details of our Colts cricket coaching programme here, or just scroll through the key highlights below. The FUNdamental stage (Stage 1) Those involved in this stage are primarily 9 years old or younger. All of our FUNdamental sessions focus on fun, the development of core skills (agility, balance, co-ordination, speed and quickness) and maximise player involvement. The early development of core cricketing skills, social awareness and sportsmanship are also key targets During this stage, players will have the opportunity to play softball matches within the club setting and as part of the local Under 9s league. Play and Perform (Stage 2) Those involved in this stage will commonly be aged between 9-12 years old. The main aim of our Play and Perform sessions is to further enhance core cricketing skills within an enjoyable activity-based context. During this stage, players will have the opportunity to play hardball cricket within the club setting and as part of the local leagues. Technical development (Stage 3) Those involved in this stage will commonly be preparing for the transition to adult cricket. As players begin to become more analytical about their own performance, the aim of our Technical development stage is to help them to make the necessary adjustments to their game, which will benefit their own performances and those of their team. Social and emotional development are also key areas of focus at this stage. During this stage, players will have the opportunity to play competitively within their own age group leagues and may have the opportunity to play adult cricket too. Staying in the Game (Stage 4) With so many other potential commitments and opportunities available to players as they reach the end of their time in the Colts section, keeping them involved in cricket can often be a challenge. At Ansty, our senior sides illustrate just how incredibly successful we have been at keeping our Colts involved with the club, with the vast majority of those playing in the 5 senior XIs being products of our Colts system. Leaving the Colts section behind and being a regular part of the senior club can be both an exciting and daunting prospect. But with the appropriate support, this transition can be very successful and have benefits for individual players and the club itself. 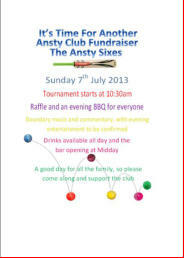 Ansty Cricket Club Colts ‘Cricket for all!’: But what does that mean?